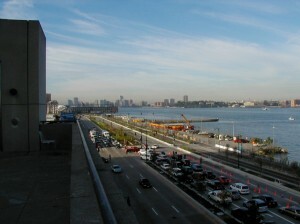 I climbed up to the 2nd floor of the Javits Center and looked down West Side Drive towards Ground Zero for a last look. Unlike the first few days there was no smoke rising from the pile, and the view was rather peaceful. Not being a resident of the area the lack of two major building in the skyline was not affecting me. We then lined up all the trucks and headed out of town. Somewhere in CT I got a phone call from the State Fire Marshalls office and asked if I could have the Task Force swing by the Statehouse on the way home so the Governor could greet us as we returned. 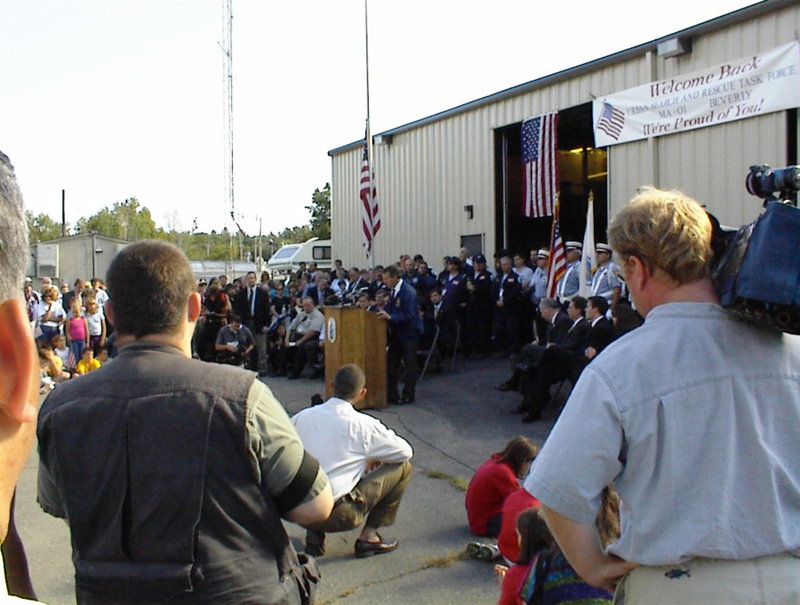 The Task Force and the State were always at odds over funding. The State had not put 1 penny into our program and in my opinion had thrown several “banana skins” on our path to deployment. I told whomever was on the other end of the phone that the only way I would take the Task Force to the State House is if “the Governor had a check for $100,000 in her hand for us when got there”. However, I did not have any issues if the Governor (Jane Swift) came and met us in Beverly. The final arrangement was for the Governor to come to our cache site in Beverly. There was a minor problem however we were scheduled to arrive home 1 hour before the Governor could get to Beverly. Without most of the general population knowing it, I arranged for the Task Force to have one last lunch at a rest area on the Mass Turnpike in Sturbridge. MATF Team photo taken at Sturbridge rest stop on trip home. We still were a little early so we took a few more minutes for a group shot behind the restaurant in Sturbridge. The bottom line was that we arrived on time for the Governor and the press in Beverly. When we arrived we pulled in behind the cache and came out of the cache building behind the Governor and in front of the press cameras. I took a few hits from our Task Force folks for not meeting directly with the families but it worked out in the end.